Newspaper articles, publications, relevant thoughts from subject matter experts, industry leaders and/or communications professionals. The Homewood Research Institute (HRI) has created an infographic that summarizes early findings from the Post-Discharge Outcomes Monitoring System (PDO), also known to Homewood patients as the Recovery Journey Project. 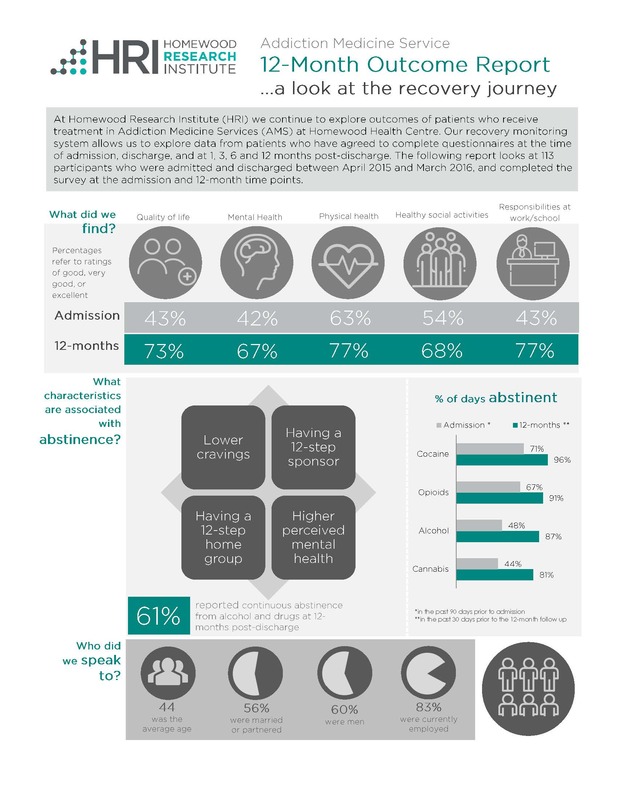 The infographic outlines changes in various indicators of recovery between the time of admission and 12-months post-discharge for patients who receive treatment in the Addiction Medicine Service at Homewood Health Centre. 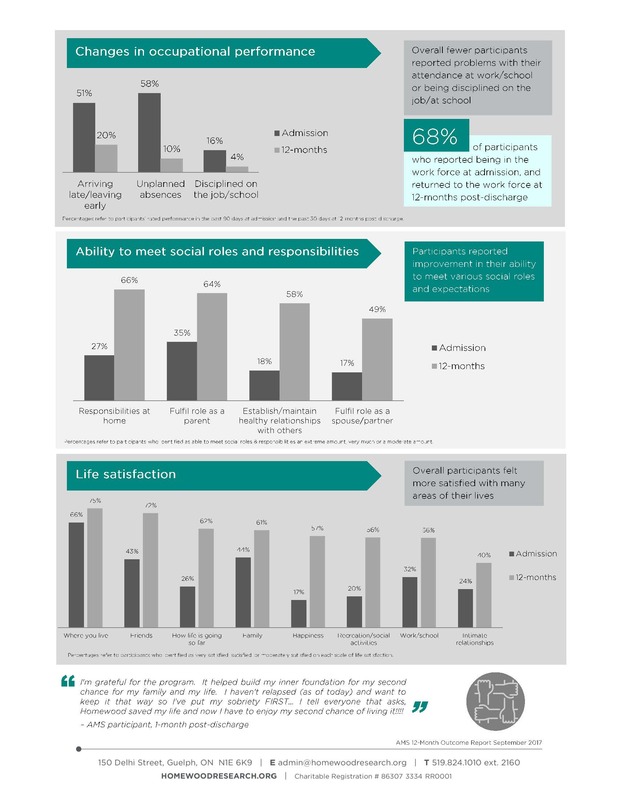 It also provides an overview of participant demographics, abstinence trends, and changes in occupational performance, social roles, and overall life satisfaction. Unique in Canada, HRI’s PDO system supports the comprehensive evaluation of the long-term impacts of treatment interventions. Future directions for this initiative include the expansion and tailoring of the system to measure outcomes among those treated for post-traumatic stress disorder (PTSD) and other mental health conditions. The PDO system provides a thorough and quantifiable understanding of what happens once patients leave residential care and holds great promise for evaluating and informing evidence-based care across Canada. Homewood Health will honour military women and their families by sponsoring the 9th Annual True Patriot Love Toronto Tribute Dinner on Thursday, November 9th. The True Patriot Love Foundation is a registered charity dedicated to harnessing the passion Canadians feel for military and veteran families on November 11th and finding ways to express it throughout the year. Toronto, ON -- (November 6, 2017) - Homewood Health will honour military women and their families by sponsoring the 9th Annual True Patriot Love Toronto Tribute Dinner on Thursday, November 9th. The True Patriot Love Foundation is a registered charity dedicated to harnessing the passion Canadians feel for military and veteran families on November 11th and finding ways to express it throughout the year. Homewood Health is deeply committed to the health and wellness of our soldiers, veterans and their families explained President and CEO of Homewood Health, Jagoda Pike. True Patriot Love is building on the knowledge that there can be a cumulative effect when individuals are exposed to multiple incidents that are emotionally damaging. “When a military service person has been in duty for several years, the amount of trauma that they are exposed to could leave them at risk of developing a mental health issue,” Pike said. “We want to support True Patriot Love in raising awareness about the risks service women and men undertake, and help build community support for them and their families. Please join the Homewood Community Addiction Services (CADS) for a one-day workshop, where Theo will bare his soul, as he shares his raw, unrefined and refreshingly honest journey through his painful past with trauma, alcoholism and drug addiction. Theo will share his mistakes, his triumphs and his new learnings, while creating a safe space for conversations on trauma and healing. While you may remember Theo Fleury as a former NHL All-Star, Stanley Cup winner and Olympic gold medalist, he is also the two-time best-selling author of Playing with Fire & Conversations with a Rattlesnake. He will discuss how to overcome obstacles and practice mindfulness, and he will encourage others to tell their stories without shame or fear. In turn, he will demonstrate how we must all learn compassion and humility. Theo’s incredible life experience, both on the ice and off, has given him a wealth of embodied knowledge on the topics of pursuing excellence and personal growth. His insightful perceptions allow him to look beyond external behaviors to what lies beneath the surface. To this conversation, he will bring clarity, honesty and compassion because he has been there and he knows what is needed. Theo was awarded the Canadian Humanitarian Award, The Queen’s Jubilee Medallion, and he is an Honorary Chief and recipient of the Aboriginal Indspire Award. In 2014, Theo was awarded with an honorary doctorate in Science from the University of Guelph-Humber for outstanding contributions to the Mental Health of Canadians. In 2015, he received a second honorary doctorate in Laws from Brandon University in recognition for his contributions combating child sexual abuse and for his outstanding efforts to promote healing and recovery. Don’t miss this insightful and compassionate conversation. Registration, breakfast and networking begin at 7:30am. Theo's workshop begins at 9am. Autograph signing, networking and silent auction from 12:30pm- 2pm. All proceeds from ticket sales will be donated to the Homewood Volunteer Association to support Community Addictions Services (CADS) clients in need, within our local community. *A gentle notice please, we ask that the presentation not be audio or video recorded. Pictures are welcome, however please refrain from using your flash. Thank you. Wilfrid Laurier University and The Homewood Health Centre have partnered to establish the first music therapist-in-residence at Laurier. This partnership will bring together Laurier’s renowned music therapy program and the Manfred and Penny Conrad Institute for Music Therapy Research with Homewood Health’s 134 years of leading clinical experience in mental health and addiction treatment. Wilfrid Laurier University and The Homewood Health Centre have partnered to establish the first music therapist-in-residence at Laurier. This partnership will bring together Laurier’s renowned music therapy program and the Manfred and Penny Conrad Institute for Music Therapy Research with Homewood Health’s 134 years of leading clinical experience in mental health and addiction treatment. Music therapy uses music and musical elements to promote, maintain and restore mental, physical, emotional and spiritual health. Mitchell will join the Homewood team in the role of music therapist and professional discipline leader. In this position, Mitchell will supervise undergraduate and graduate student placements, provide clinical services at The Homewood Health Centre, and instruct courses at Laurier’s Waterloo campus as the music therapist-in-residence. Mitchell will also partner with the Homewood Research Institute to advance the understanding and study of music therapy. Mitchell, who received her Master of Music Therapy from Laurier and her Bachelor of Music, Honours Music Education from the University of Western Ontario, is currently completing her PhD in Music Education, also at the University of Western Ontario. Mitchell is an associate of the Royal Conservatory of Music, with a diploma in piano performance, as well as a registered psychotherapist and a music therapist accredited with the Canadian Association of Music Therapists. The music therapist-in-residence position is made possible through a generous donation from Bryce and Nancy (Sauder McLennan) Walker, who have a long-standing relationship with Laurier. The music therapy program at The Homewood Health Centre will officially launch on March 17, 2017 with a ribbon cutting in the music therapy space. All media are invited to join and will have the opportunity to speak with Jagoda Pike, Elizabeth Mitchell, Kevin Swinden and both Bryce and Nancy Walker. Media are asked to park in the lot directly across the street from 150 Delhi Street (parking fee will be waived) and enter Homewood Health Centre through the main entrance near switchboard where you will be escorted down to the Music Therapy space. For more information on this event or Homewood Health in general, contact Maureen Turner, Public Relations Manager, Homewood Health Inc. by phone at 519.766.5805 or 1.800.265.8310 x3172 or by email at mturner@homewoodhealth.com. Homewood Health Centre is a leader in mental health and addiction services. With over 130 years of experience, the centre achieves outstanding outcomes every day through a national network of over 4,500 employees and clinical experts, and through the Homewood Health Centre—one of Canada’s largest and leading facilities for medical treatment of mental health and addiction disorders. Homewood Health is redefining mental health and addiction services to help Canadians live healthier, more productive and fulfilling lives. Laurier’s renowned Faculty of Music is dedicated to fostering artistic and scholarly development of the highest calibre and to providing a creative environment for student success. Over the past 40 years, the Faculty of Music has positioned itself as one of Canada’s top music schools, home to world-class opera, orchestra and composition programs. The faculty is home to over 450 students across seven program offerings taught by outstanding musicians, composers and music historians who continue to be active in their own careers. Homewood Health is honoured to be the VIP presenting Sponsor for Shelley Marshall’s one-woman play, Hold Mommy’s Cigarette, a fundraiser for The Homewood Research Institute (HRI), in celebration of Mental Health Week 2017. On May 1st 2017, HRI will host a special performance of the play at the River Run Centre in beautiful downtown Guelph. Proceeds from this one-night-only event will be dedicated to the Shelley Marshall Scholarship, a fund named in Shelley’s honour to support applied research, led by HRI’s clinical scientists, that aims to improve treatment for people living with Post-Traumatic Stress Disorder (PTSD). “We are pleased to present this unique and enlightening performance by Shelley Marshall,” said Roy Cameron, Executive Director of the Homewood Research Institute. The show, which kicks off Mental Health Week 2017, is an autobiographical play that details Marshall’s personal struggle with mental illness, addressing her father’s suicide and her own suicide attempt, as well as her journey back to purpose and fulfillment. “I knew creating works of art that expressed my experience, my truth, and my understanding, were what would bring a joyful purpose to my life,” says Marshall. Marshall’s performance will take you on a roller coaster of emotions. It’s gritty and honest, raw and heartbreaking and, most of all, painfully funny. She has gained national attention and received many awards, including the Gold Award for Best Theatre Production (View Magazine) and Best New Discovery (Now Magazine). Most importantly, Marshall’s story is bringing much-needed awareness to mental health, and inspiring discussions about resilience and finding real solutions to mental health issues. The Homewood Research Institute (HRI) is an independent not-for-profit organization that works in partnership with Homewood Health and leading scientists from Canadian universities. We are dedicated to research and evaluation to improve care and outcomes for people with mental health and addiction issues, particularly PTSD. ​Homewood Health Centre has treated addiction for more than 130 years. As Canada’s leader in addiction recovery, we understand that getting well and staying well are equally important and that recovery is a life-long commitment. Each year, we celebrate the ongoing successes of our Addiction Medicine Service patients at the Homewood Spiritual Renewal Service. This special annual event provides our program alumni, staff, volunteers, current patients and Board members with a unique opportunity to celebrate the spirit of recovery, peace and harmony in their daily lives. Homewood Health Centre has treated addiction for more than 130 years. As Canada’s leader in addiction recovery, we understand that getting well and staying well are equally important and that recovery is a life-long commitment. Each year, we celebrate the ongoing successes of our Addiction Medicine Service patients at the Homewood Spiritual Renewal Service. This special annual event provides our program alumni, staff, volunteers, current patients and Board members with a unique opportunity to celebrate the spirit of recovery, peace and harmony in their daily lives. The event is co-sponsored by the Homewood Volunteer Association and the Homewood Foundation and is well-attended each year. This year marks the 27th anniversary of the Spiritual Renewal Service. Originally celebrated as a small dinner and dance for program alumni in the 1980s, the service quickly gained popularity and was expanded to include inpatients, staff and volunteers. Each year, the number of attendees and returning alumni continues to grow. When the Homewood gymnasium and conference centre could no longer accommodate the event, it was relocated to the beautiful River Run Centre in historic downtown Guelph, where it is held today. 2016 saw over 600 guests in attendance to honour and celebrate both the struggles and triumphs on the road to addiction recovery. The 2017 Spiritual Renewal Service will be held on Wednesday, June 21 at the River Run Centre in Guelph. The evening will feature a fellowship ceremony, a celebratory service and candle-lighting to honour the continued successes of our patients – past and present. The Spiritual Renewal Service is only one important way in which we support our alumni. We believe that post-discharge support and aftercare are integral to effective addiction recovery. As such, we offer all of our patients 36 weeks of out-patient aftercare that provides continued opportunities for continued abstinence and developing group skills to aid in successful recovery. We do our best to help behaviour change. Click to find out more about our Addiction Medicine Service and the Spiritual Renewal Service.